Being able to watch how molecules bend, stretch, break or transform during chemical reactions requires state-of-the-art instruments and techniques that can observe and track all the atoms within a molecule with high sub-atomic spatial and temporal resolution. About 20 years ago, scientists came up with the idea of using the molecule's own electrons to take snapshots of the structure and to view the molecular reaction in real time. A breakthrough for imaging complex molecules came in 2016 when the researchers, led by ICREA Prof. at ICFO Jens Biegert, achieved the required spatial and temporal resolution to take snapshots of molecular dynamics without missing any events, reporting on the imaging of molecular bond breakup in acetylene (C2H2) in Science. Now, the research group has gone beyond their previous discovery and achieved another milestone. In a recent study published in the Proceedings of the National Academy of Sciences (PNAS), ICFO researchers Dr. Kasra Amini, Dr. Michele Sclafani, Dr. Tobias Steinle, Aurelien Sanchez, led by ICREA Prof. at ICFO Dr. Jens Biegert, have observed the structural bending and stretching of the triatomic molecular compound carbon disulphide, CS2. 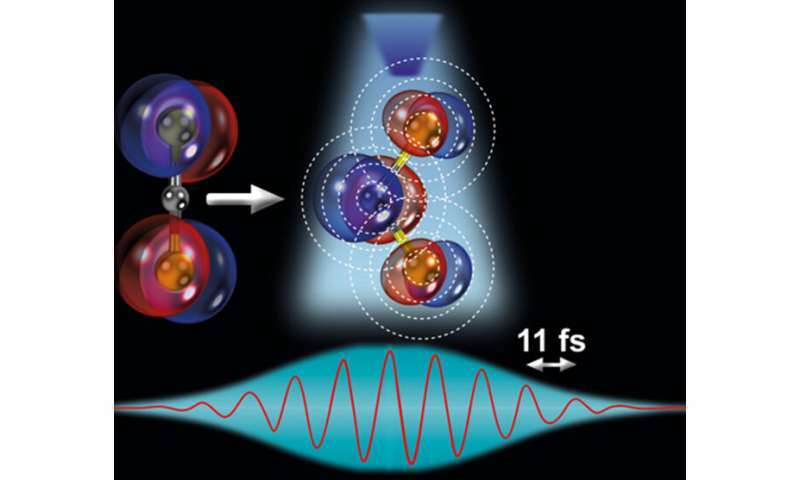 To observe this phenomenon, the researchers used laser-induced electron diffraction, a molecular-scale electron microscope technique that captures clean snapshots of the molecule's geometry with combined sub-atomic picometre (pm; 1 pm = 10-12 m) and attosecond spatio-temporal resolution. They reported that the ultrafast modifications in the molecular structure are driven by changes in the electronic structure of the molecule, governed by the Renner-Teller effect. This effect is key for important triatomic molecules such as carbon disulphide, CS2, since it can determine specific chemical reactions in the Earth's atmosphere that could, for example, affect climate conditions. Now, for the first time, the team has directly imaged this effect in their experiment, obtaining snapshots in real time, seeing the molecule stretch symmetrically and bend in a linear-to-bent structural transition within ~85 fs (eight laser cycles). This was possible thanks to the use of a state-of-the-art quantum microscope composed of: (i) a mid-infrared 3.1 µm intense, femtosecond laser system that illuminates a single CS2 molecule with 160,000 laser pulses per second, and (ii) a reaction microscope spectrometer that can simultaneously detect the full three-dimensional momentum distribution of the electron and ion particles generated from the ionization and sub-cycle recollision imaging of a single isolated molecule. To confirm their experimental findings, the team also performed state-of-the-art quantum dynamical theoretical simulations, and verified the match between theoretical and observational results, confirming that ultrafast linear-to-bent transition is, indeed, enabled by the Renner-Teller effect. The findings signify a major step forward in understanding the underlying effects that take place in molecular dynamic systems.